This is one of those beautiful and often overlooked places that make our State Parks an incredible asset. 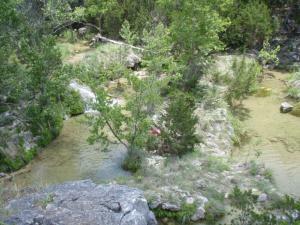 Crystal clear swimming holes and cascading water falls make this an incredible place to take in nature and enjoy a dip. There are areas where you follow the path and some pretty steep rock faces and areas where you have to get your feet wet, but always you are surrounded by beauty. We went out to see Gorman Falls but because of an issue with the new Park Pass system needed to stay closer to the HQ. The ranger recommended this hike and I am so glad he did. It was the best I have hiked so far. Also, we only saw one other small group of people the whole day. More of a walk than a hike. The falls are beautiful and a great place for a picnic or lazy afternoon. A Labyrith Trial, Bridges and covered observation stands along with picnic tables, playground, spray park and kayak rentals. This park has a lot to offer just not solitude.